The service is connected to an intuitive smartphone application. You can get real-time information about your vehicle from anywhere in the world. Drivers in Santa Rosa can check on the status of their vehicle, see its location, and even push navigational information to the in-cabin infotainment system. The service can also notify you of any attempted break-ins. Should your XC40 be stolen, you'll be able to track its location with satellite connectivity. 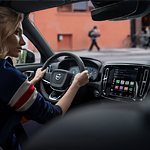 Volvo On Call can also be used daily to make your life easier. On cold winter days, you can start the engine from inside your home so that the climate control system can adjust the temperature of the cabin. You'll also have the ability to lock your doors, grant access to friends or family, and much more.